There are two types of looks when it comes to fashion: trendy and classic. If you follow the trends, you’re always looking for the latest style to incorporate into your wardrobe. But if you consider yourself to have more of a classic style, then investment pieces are the way to go. Depending on your own classic style, the list of timeless wardrobe pieces can vary. However, some of the most common standout pieces are the trench coat, a wool pea coat, a leather jacket, khaki chinos, a navy suit, leather cap toe oxfords, and of course, a classic watch. Wearing a watch that’s not an Apple watch is a fun way to celebrate a classic fashion accessory that deserves an encore. If you’ve been considering purchasing a classic watch, check out the eight reasons below why they’re back in style. A mechanical watch tells times by hand-winding a mainspring inside the watch. As a result, the hands move around the face of the watch in a precise manner. Fans of this type of watch enjoy both the sophisticated engineering as well as not having to worry about battery replacement. Similar to a mechanical watch, a mainspring and gears are the primary components of a self-winding watch. However, the main difference between self-winding is in the way the clock automatically keeps time. It works based on your daily movement and how it triggers the watch to wind itself through an internal weight called a rotor. Every time you move your wrist, the rotor winds the mainspring. Low-maintenance quartz watches offer the best of both worlds: precision time-telling and low in cost. In fact, quartz watches are proven to be the most accurate watch movement of all. Because they are battery operated, there is no need to worry about winding them by hand, either. A solar-powered watch uses the sun to charge the solar cells of the watch. Similar to the function of batteries or the self-winding feature, solar cells stay charged and extra energy is then stored in the solar battery. In addition to a watch’s movement style, there are also several traditional watches to choose from. In a sea of smartwatches, these watch styles are an act of rebellion. Some of these styles come with interchangeable wristbands, while others come with a fixed band. Different band materials are gold, silver, cloth, rubber, nylon, plastic, leather, or stainless steel. Consider your lifestyle and choose a watch display style to match it. Admit it. In some ways, technology has made us creatures of convenience. 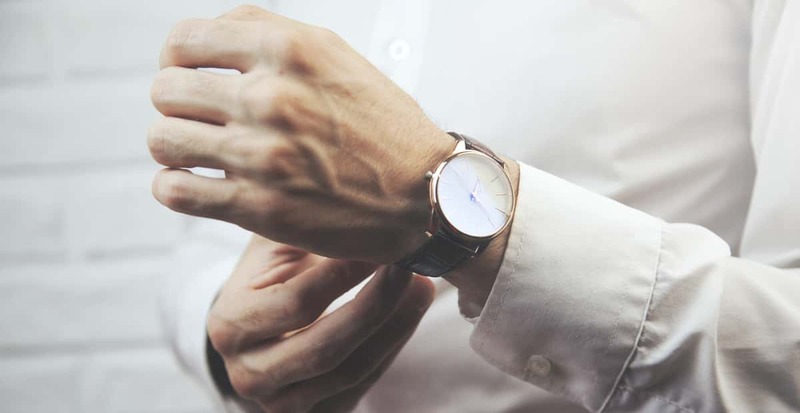 But wearing a watch changes that up a bit because instead of relying on our smartphones to tell us the time, we can stay focused on one task: looking at our wristwatch. Another great reason for wearing a watch is affordability. You won’t have to worry about spending a ton of money for a classic looking watch. Unless, of course, you’re interested in an investment piece for your wardrobe. Instead of pulling your phone out of your pocket every five minutes to check the time, a simple glance at your wrist will do the trick. This is also a great idea for those who can easily become distracted by their phones. Wearing a vintage watch can indulge your vintage tastes as well. Not only will a vintage watch punch up your style, but it will also be a topic of conversation and a postcard from the past. Choosing to wear a watch can say a lot about how you express your personal style. Whether it’s a solid tank watch, a colorful diving watch, or a handsome leather wristband, you’ll make a fashion statement no matter what type of watch you wear. How many of us have several wristwatches tucked away in our closets that are family heirlooms? Instead of keeping it locked away, why not consider taking it to a jewelry repair shop for a tuneup and an update? Not only will it be a great conversation piece, but it will give you a connection to your past. A win-win situation if you ask us. Another great reason for wearing a watch is the versatile features offered. Yes, telling time is the number one tasks; however, some watches feature a stopwatch function as well as display the lunar cycles. The complex internal mechanisms of a watch are the result of optimum craftsmanship. It’s not just an assembly line putting together the watch, it’s often a team of artists working diligently on each moving part – especially if the watch is a vintage model. Are Luxury Brands Your Weakness? If you’re in need of some valuable insight or watch reviews, ProwatchesÂ is a great resource for watch lovers and owners alike. Now that you’ve got some great tips on how wearing a watch will make you more stylish, it’s time to go shopping! For more style advice and the latest trends, check out our fashion blog.